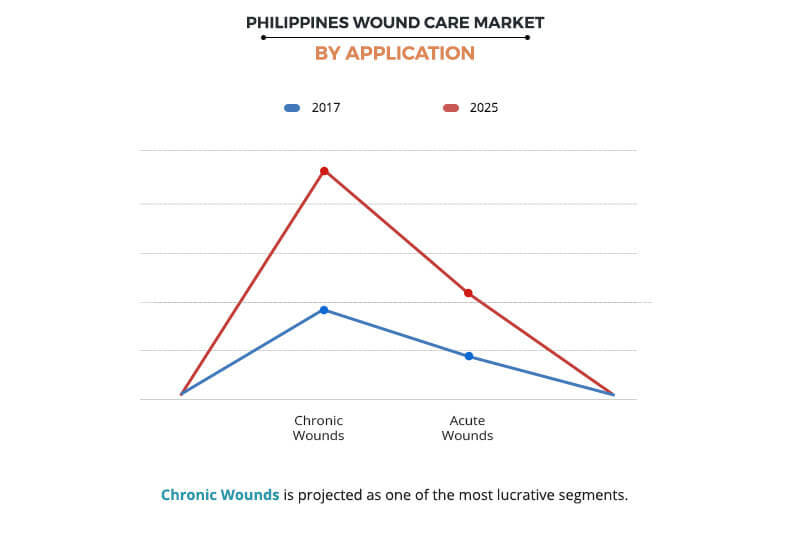 The Philippines wound care market size in 2017 is $51 million, and is projected to reach $85 million by 2025, growing at a CAGR of 6.5% from 2018 to 2025. Surgical equipment is used for viewing internal body organs or modifying biological tissues. Traditional wound care and advanced wound care products are used to treat acute and chronic wounds. Advanced wound care is emerging as a standard solution to treat chronic wounds, which takes substantial time to heal and are expensive to treat. Traditional wound care products are being increasingly substituted with advanced wound care products due to their efficiency and effectiveness to treat wounds by enabling faster healing. Increase in the number of surgical procedures and rise in demand for technologically advanced surgical procedures such as minimally invasive surgeries and laparoscopic surgeries. Hence, these aforementioned factors helps in increasing the Philippines wound care market share. 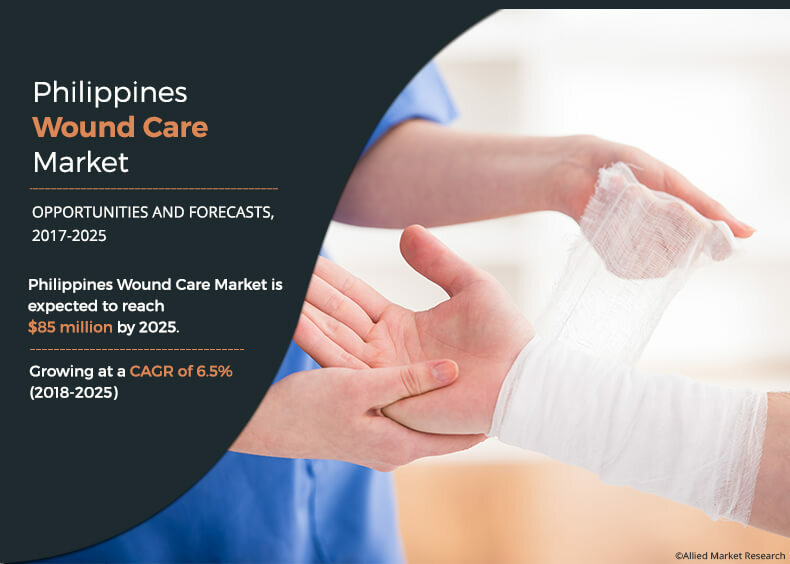 The Philippines wound care market is expected to register substantial growth in the near future, owing to the rapidly aging population & favorable demographics; rise in incidence of diabetes, obesity, & chronic conditions; and technological advancements to deal with complex wounds. In addition, increase in awareness to reduce healthcare costs further supplements the Philippines wound care market growth. However, reluctance in adoption of new technologies, development of substitute products, and lack of sufficient evidence restrain the growth of the market. Conversely, increased focus toward advanced treatment protocols and significant unmet needs in wound care are expected to offer remunerative opportunities for market players. Based on product, the market is segmented into advanced wound care, surgical wound care, and traditional/basic wound care. Advanced wound care is sub segmented into infection management, exudate management, active wound care, and therapy devices. Infection management is the leading segment, and is further classified into silver dressings, non-silver dressings, and collagens. Exudate management is sub-segmented into hydrocolloid dressings, foam dressings, alginate dressings, and hydrogel dressings. Active wound care is further divided into skin substitutes and growth factors. Therapy devices is sub-segmented into negative pressure wound therapy (NPWT), oxygen & hyperbaric oxygen equipment, electromagnetic therapy devices, and others. Surgical wound is further categorized into sutures & staples, tissue adhesives, sealants, & glues, and anti-infective dressings. Tissue adhesives, sealants, & glues are further divided into fibrin-based sealants, collagen-based sealants, and synthetic adhesives/glues. Traditional/basic wound care are sub-segmented into medical tapes, dressings, and cleansing agents. The surgical wound care segment was the major revenue contributor in 2017, and is anticipated to continue this trend during the forecast period, owing to increase in the number of surgical procedures and rise in demand for technologically advanced surgical procedures such as minimally invasive surgeries and laparoscopic surgeries majorly drive the growth of the market. Furthermore, rise in geriatric population who are highly susceptible to ocular disorders, gastric disorders, intestinal disorders, and other health conditions present Philippines wound care market opportunity to the market players. Depending on application, the Philippines wound care market is bifurcated into chronic wound care and acute wound care. The chronic wounds segment is further categorized into pressure ulcers, diabetic foot ulcers, venous leg ulcers, and arterial ulcers. The acute wounds segment is further segmented into burns & trauma and surgical wounds. The chronic wounds segment is projected to exhibit the highest growth during the forecast period. This is attributed to the rise in geriatric population, increase in awareness toward wound care management, and improved diagnosis fuel the demand for chronic wound care products. 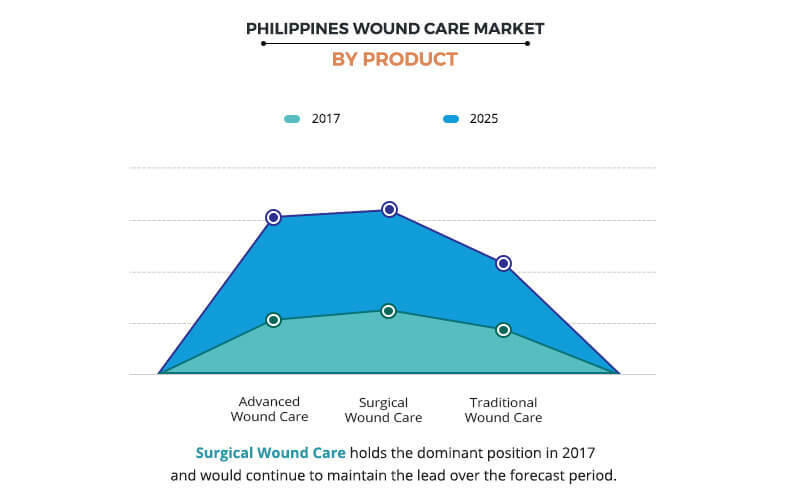 The report provides a comprehensive Philippines wound care market analysis of the key players operating in the Philippines wound care industry, namely 3M Company, Smith & Nephew Plc., Coloplast A/S, Medtronic plc, ConvaTec Group Plc, Cardinal Health, Inc., BSN Medical GmbH, Mundipharma International Ltd., B. Braun Melsungen AG, and Urgo Medical. The other players in the value chain include Mebo International Group, Total Wound Care Solution Corporation Philippines, ASO Philippines, Inc., Medline Industries, Inc., and others. This report provides a detailed quantitative analysis of the current Philippines wound care market trends and Philippines wound care market forecast estimations from 2018 to 2025, which assists to identify the prevailing market opportunities. An in-depth Philippines wound care market analysis includes analysis of various regions is anticipated to provide a detailed understanding of the current trends to enable stakeholders formulate region-specific plans. A comprehensive analysis of the factors that drive and restrain the growth of the Philippines wound care market is provided. Region-wise and country-wise Philippines wound care market conditions are comprehensively analyzed in this report. Key market players within the Philippines wound care market are profiled in this report and their strategies are analyzed thoroughly, which helps in understanding competitive outlook of Philippines wound care market. 7.8. SMITH & NEPHEW PLC. The surgical wound care segment generated the highest revenue in 2017. Traditional wound care products are being increasingly substituted with advanced wound care products due to their efficiency and effectiveness to treat wounds by enabling faster healing. Surge in geriatric population & favorable demographics; rise in incidences of diabetes, obesity, and chronic conditions; technological advancements to deal with complex wounds; and increase in awareness to reduce healthcare costs drive the growth of the market. However, reluctance in adoption of new technologies, development of substitute products, and lack of sufficient evidence restrain the growth of the market. Conversely, increased focus toward advanced treatment protocols and significant unmet needs in wound care are expected to offer remunerative opportunities for market players. Based on product segment, the surgical wound care segment is expected to maintain its dominant position throughout the analysis period, due to increase in accidents and rise in number of surgeries in the country. In addition, the advanced wound care segment is expected to grow at the highest CAGR during forecast period. In the end user segment, community centers accounted for major share of the Philippines wound care market in 2017, and is projected to maintain this trend throughout the forecast period. This is attributed to the increase in the adoption rate of high-technology solutions and availability of wide range of wound care products under one roof coupled with government reimbursements.